A UNLV journalism student put together this newletter about “Intentional Gatherings” and the “Vegas Valley Missional Community Network“. Hopefully it will begin to circulate throughout Las Vegas and begin to connect the other simple/home/organic churches or “missional communities” in the Valley. The student’s purpose is to connect like-minded individuals in the city to know about one another, and eventually partner to be on mission together to spread the Gospel in the Las Vegas! Praise Christ! 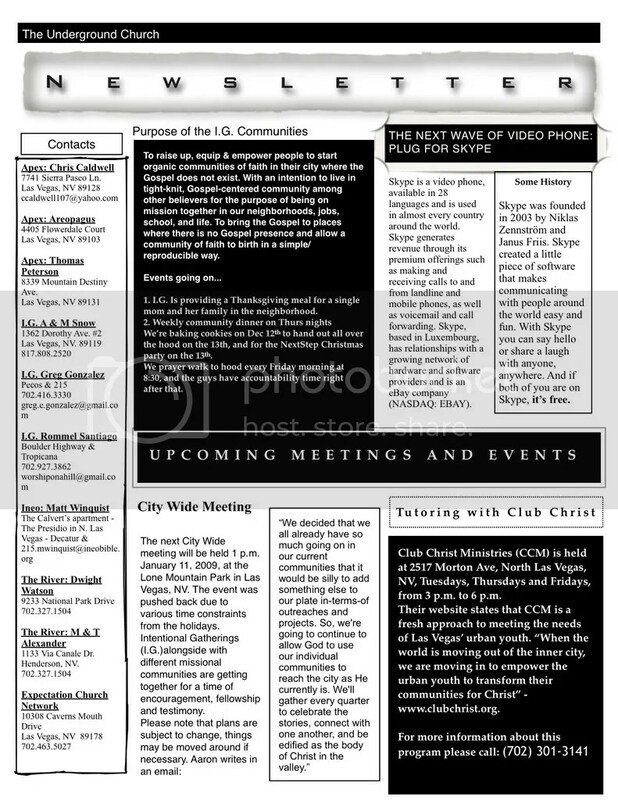 For more information on “Intentional Gatherings” or the “Vegas Valley Missional Community Network” send an email to iglasvegas@gmail.com OR contact any of the individuals listed on the newsletter.